Marshall (Mike) S. Smith is retired and a Visiting Scholar at the Carnegie Foundation for the Advancement of Teaching. During its first two years he served in the Obama administration as the Senior Counselor to the Secretary of Education and Director of International Affairs. From 2001-2009 he directed the Education Program at the William and Flora Hewlett Foundation. Prior to that, in the Clinton Administration, he was the undersecretary of education for seven years, responsible for all policy and budget matters, and for four of those years also the acting deputy secretary, the second ranked person in the US Department of Education. During the Carter administration, he served as the chief of staff to the first secretary for education and assistant commissioner for policy studies in the Office of Education. In the Ford administration he was the director of policy and budget for the National Institute of Education. While not in government, he was at different times an associate professor at Harvard University and a professor at the University of Wisconsin at Madison and at Stanford University where he also served the Dean of the School of Education. 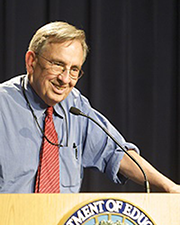 He has authored a large number of publications on topics varying from computer content analysis, evaluation and research methodology, social and educational inequality, early childhood education, open educational resources, federal policy and school reform. He is a member of the National Academy of Education. All of his degrees are from Harvard University.